BRUSSELS, Belgium -- A top European Union official blasted Russia for reviving threats of retaliation against Ukraine over a trade deal with the bloc, stoking political tensions even as signs mount of a military de-escalation in the conflict zone. 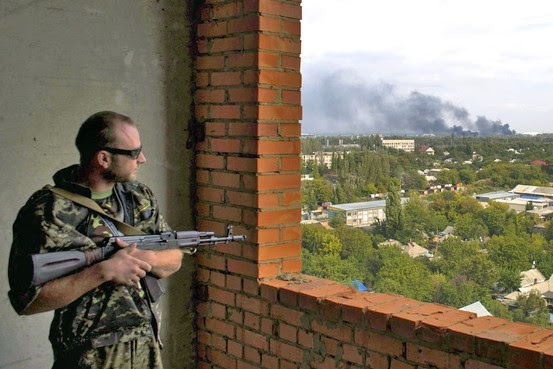 A pro-Russia rebel watches Tuesday as smoke rises near the government-held Donetsk airport, where sporadic shelling has continued. The North Atlantic Treaty Organization said that Russia had withdrawn a sizable number of troops from eastern Ukraine—though some remained. Meanwhile Russia-backed rebels in the region said they had begun pulling back their heavy artillery, after Ukrainian troops did the same. Scattered fighting continued, however, amid mutual accusations of violations of a cease-fire that took effect 2½ weeks ago—indicating any peace taking hold remains fragile as Kiev continues to challenge Moscow by seeking closer ties to Europe. In a three-way deal reached Sept. 12, the EU and Ukraine agreed to postpone part of the trade pact, including dropping tariffs on EU goods, until 2016. Russia argued the pact would lead to a flood of EU imports entering Russia and undercut Russian exports to Ukraine. It had threatened to retaliate by ending its preferential trade relationship with Kiev, a move that could deliver a fresh blow to Ukraine's tottering economy. It dropped that threat, however, in exchange for the delay, which will give both Russian and Ukrainian businesses additional time to adapt. However, Russian Economy Minister Alexei Ulyukaev sent a letter to the European Commission's trade chief and Ukraine's foreign minister last week warning that Russia could still retaliate against Ukraine for ratifying the pact. Moscow also demanded a mandate for future talks, saying that the three sides should prepare amendments to the accord, according to a copy of the letter seen by The Wall Street Journal. EU officials have insisted they won't reopen the text of the agreement. The EU's enlargement commissioner, Stefan Füle, dismissed Russia's interpretation of the Sept. 12 agreement as coming "from a different world, a parallel world." In an interview with the Journal late Monday, Mr. Füle, long the EU's point man on Ukraine, said the EU and Ukraine would soon reply to Russia but that its demands were bogus. "The Russians will have to abandon this virtual reality," he said. The Russian mission to the EU didn't respond to requests to comment. Many European officials feared that without a compromise on the trade pact, Russia could sow fresh trouble in eastern Ukraine. Russia denies orchestrating or supporting the rebels there. EU foreign ministers attending the United Nations General Assembly meetings in New York met Tuesday to discuss the situation in Ukraine and next steps on Russia sanctions, European diplomats said. The EU had promised to reconsider its latest sanctions by the end of this month in light of the cease-fire deal. A senior U.S. official said Sunday that it was too early to even consider rolling back sanctions, and that "we are far from" the point where the plan has been fully implemented. German Chancellor Angela Merkel on Monday said the cease-fire and a political process to solve the conflict couldn't happen without the full withdrawal of Russian armed forces. On Tuesday, a NATO spokesman, Lt. Col. Jay Janzen, said: "There has been a significant pullback of Russian conventional forces." But he said exact numbers were hard to pinpoint and that special forces were still operating in Ukraine. "It is clear that NATO allies need to remain vigilant," he said. Russia has faced escalating sanctions from the West over what NATO has said in recent weeks was about 1,000 troops in Ukraine fighting alongside the rebels in eastern Ukraine. Russia didn't comment on NATO's claims Tuesday or Saturday. It has consistently denied that it has sent troops in Ukraine, though it has allowed that some soldiers may have gone to fight on their vacations. Kiev and the Russia-backed rebels agreed last weekend to set up an 18-mile-wide buffer zone along the front line to reduce tension and bolster a Sept. 5 truce, but mutual mistrust has cast doubt on the process. "There does seem to be, for the first time in several months, a set of indicators that seem to point in one direction, which is de-escalation," one senior NATO diplomat said. Still, he added, "we've seen any number of occasions in the last six or eight months where indicators pointed one direction, and we wake up some random Wednesday and they start pointing the other direction." Meanwhile, a rebel leader said his forces were pulling back artillery, but only from areas where Ukrainian units have pulled back. "Where Ukraine hasn't withdrawn artillery, we also haven't done so," Alexander Zakharchenko, the prime minister of the self-proclaimed Donetsk People's Republic, told the Interfax news agency. The Ukrainian government didn't comment on Zakharchenko's claim. On Tuesday, defense spokesman Col. Andriy Lysenko said that while some Russian units had been seen crossing the border back into Russia, others had entered Ukraine. "A rotation of units is taking place," he told a daily briefing. He also accused Russia of continuing to operate training camps for separatist fighters on its territory as well. The six-month conflict in Ukraine has already claimed over 3,500 lives according to a U.N. report. The rebel-held stronghold of Donetsk in particular remains tense, with reports of overnight shelling near residential areas and the government-held airport. The Donetsk city council said that a male civilian was killed during the fighting and that residents reported hearing scattered shooting Tuesday morning. There were no casualties among government troops, Col. Lysenko said. Zakharchenko told Interfax that the negotiators involved in the peace talks would likely meet again in the Belarusian capital of Minsk in about a month.